A lively one hour online safety presentation held in your school and covering all aspects of personal safety, sexting, radicalisation, social media, cyberbullying and gaming. This presentation delivers key messages and advice to your parents. As well as outlining online risks, it demystifies the technology of messaging and social media such as Facebook and Instagram. The presentation gives plenty of practical advice that parents can implement straight away. It is has been written by school technology guru and online safety expert Brett Laniosh whose work has been endorsed by Police and Crime Commissioners. The presentation has been delivered in many schools and is always well received. The sessions run for an hour and time is given over for questions. A flexible approach means that the presenter can modify the delivery depending on the issues raised. Parents complete an evaluation, the results of which are sent to the school so that they can get feedback and identify issues. All those attending receive an informative handout and access to a dedicated online resource containing regularly updated information and guidance. Advice from CEOP and other agencies is that schools need to engage with their communities in order to promote online child safety. Schools are (or should be) delivering e-safety as part of their curriculum and this and other factors contribute to a safe environment. The real dangers lie outside the school network. Many homes provide little if any of the filtering tools and resources taken for granted in schools. In a sea of rapid technological change it is no wonder that parents are finding it increasingly difficult to know how to keep their children safe online. 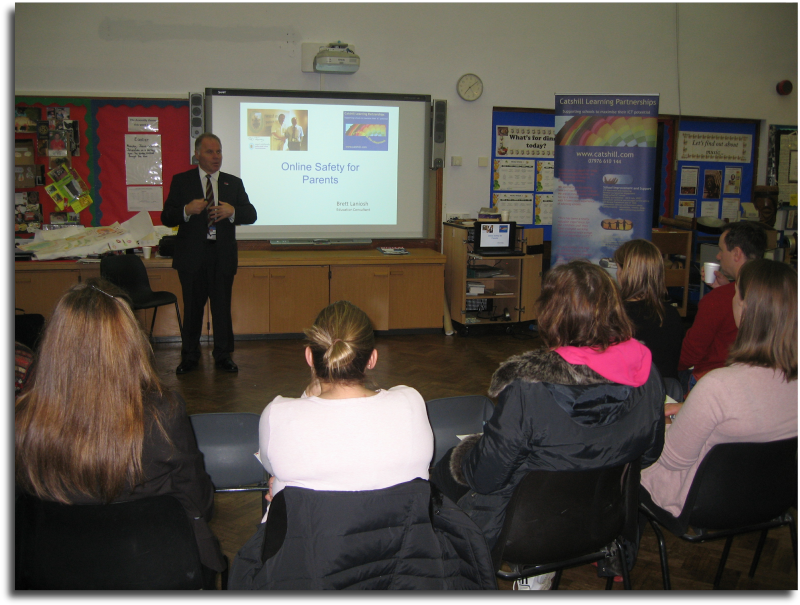 The parental information evening was well received and proved a valuable tool in helping educating young people in our community. We also enjoyed a 1 hour staff session, which highlighted some very real dangers for people in our profession.